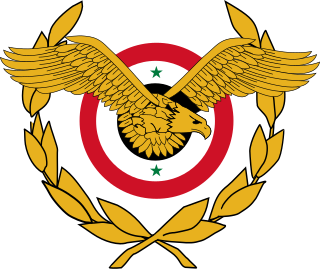 The Syrian Arab Armed Forces (Arabic: القوات المسلحة العربية السورية‎) are the military forces of the Syrian Arab Republic. They consist of the Syrian Arab Army, Syrian Arab Navy, Syrian Arab Air Force, Syrian Arab Air Defense Force, and several paramilitary forces, such as the National Defence Force. 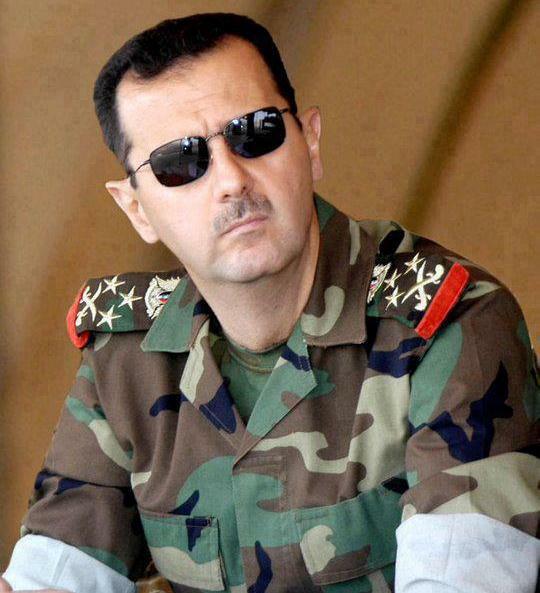 According to the Syrian constitution, the President of Syria is the Commander-in-Chief of the Armed Forces. The military is a conscripted force; males serve in the military upon reaching the age of 18, but they are exempted from service if they don't have another brother who can take care of their parents. Since the Syrian Civil War, the enlisted members of the Syrian military have dropped by over half from a pre-civil war figure of 325,000 to 150,000 soldiers in the army in December 2014, due to casualties, desertions and draft dodging, reaching between 178,000 and 220,000 soldiers in the army, in addition to 80,000 to 100,000 irregular forces. Before the start of the Syrian Civil War, the obligatory military service period was being decreased over time. In 2005, it was reduced from two and a half years to two years, in 2008 to 21 months and in 2011 to a year and a half. Since the Syrian Civil War the Syrian government has reportedly engaged in arrest campaigns and enacted new regulations, with citizens who have completed mandatory conscription being called up for reserve duty. The French Mandate volunteer force, which would later become the Syrian army, was established in 1920 with the threat of Syrian−Arab nationalism in mind. Although the unit's officers were originally all French, it was, in effect, the first indigenous modern Syrian army. In 1925 this force was expanded and designated the Special Troops of the Levant (Troupes Spéciales du Levant). In 1941, during World War II, the Army of the Levant participated in a futile resistance to the British and Free French invasion that ousted the Vichy French from Syria during the Syria–Lebanon Campaign. After the Allied takeover, the army came under the control of the Free French and was designated the Levantine Forces (Troupes du Levant). French Mandate authorities maintained a gendarmerie to police Syria's vast rural areas. This paramilitary force was used to combat criminals and political foes of the Mandate government. As with the Levantine Special Troops, French officers held the top posts, but as Syrian independence approached, the ranks below major were gradually filled by Syrian officers who had graduated from the Homs Military Academy, which had been established by the French during the 1930s. In 1938 the Troupes Spéciales numbered around 10,000 men and 306 officers (of whom 88 were French, mainly in the higher ranks). A majority of the Syrian troops were of rural background and minority ethnic origin, mainly Alawis, Druzes, Kurds and Circassians. By the end of 1945 the army numbered about 5,000 and the gendarmerie some 3,500. In April 1946 the last French officers were forced to leave Syria due to sustained resistance offensives; the Levantine Forces then became the regular armed forces of the newly independent state and grew rapidly to about 12,000 by the time of the 1948 Arab−Israeli War, the first of four Arab−Israeli wars between 1948-86. The Syrian Armed Forces fought in the 1948 Arab–Israeli War (against Israel) and were involved in a number of military coups. Between 1948-67 a series of coups destroyed the stability of the government and any remaining professionalism within the armed forces. In March 1949 the chief of staff, Gen. Husni al-Za'im, installed himself as president. Two more military dictators followed by December 1949. Gen. Adib Shishakli then held power until deposed in the 1954 Syrian coup d'etat. Further coups followed, each attended by a purge of the officer corps to remove supporters of the losers from the force. In 1963 the Military Committee of the Syrian Regional Command of the Arab Socialist Ba'ath Party spent most of its time planning to take power through a conventional military coup. From the very beginning the Military Committee knew it had to capture al-Kiswah and Qatana--two military camps--seize control of the 70th Armored Brigade at al-Kiswah, the Military Academy in the city of Homs and the Damascus radio station. While the conspirators of the Military Committee were all young, their aim was not out of reach; the sitting regime had been slowly disintegrating and the traditional elite had lost effective political power over the country. A small group of military officers, including Hafez al-Assad, seized control in the March 1963 Syrian coup d'etat. Following the coup, Gen. Amin al-Hafiz discharged many ranking Sunni officers, thereby, Stratfor says, "providing openings for hundreds of Alawites to fill top-tier military positions during the 1963-1965 period on the grounds of being opposed to Arab unity. This measure tipped the balance in favor of Alawite officers who staged a coup in 1966 and for the first time placed Damascus in the hands of the Alawites." The Armed Forces were involved in the 1967 Six-Day War (against Israel). Since 1967 most of the Golan Heights territory of southwestern Syria has been under Israeli occupation. They then fought in the late 1960s War of Attrition (against Israel) and the 1970 Black September invasion of Jordan. During the Yom Kippur War of 1973 the Syrian Army launched an attack to liberate the occupied Golan Heights that was only narrowly repulsed with the help of the US. Since 1973 the cease-fire line has been respected by both sides, with very few incidents until the Syrian uprising of 2011 began. Syria was invited into Lebanon by that country's president in 1976, to intervene on the side of the Lebanese government against a rebellion of PLO and Lebanese forces. The Arab Deterrent Force originally consisted of a Syrian core with participation by some other Arab League states. However, the other states withdrew their forces in the late 1970s. Syrian forces, still technically known as the Arab Deterrent Force, lingered in Lebanon throughout the Lebanese civil war (1975–90). Eventually the Syrians brought most of the nation under their control, as part of a power struggle with Israel, which occupied areas of southern Lebanon in 1978. Following the end of the Lebanese civil war in 1990, the Syrian occupation of Lebanon continued until 2005, when they were forced out by widespread public protest and international pressure, following the murder of Rafiq al-Hariri. About 20,000 Syrian soldiers were deployed in Lebanon until 27 April 2005, when the last of Syria's troops left the country. Syrian forces have been accused of involvement in that murder, as well as continued meddling in Lebanese affairs, and an international investigation into the Hariri killing and several subsequent bomb attacks has been launched by the UN. Engagements since 1979 have included the Muslim Brotherhood insurgency (1979–82), notably including the Hama Massacre, the 1982 Lebanon War (against Israel) and the dispatch of the 9th Armored Division to Saudi Arabia in 1990–91, ahead of the Gulf War against Iraq. The 9th Armored Division served as the Arab Joint Forces Command North reserve and saw little action. Syria's force numbered ~20,000 in strength (the sixth-largest contingent) and its involvement was justified domestically as an effort to defend Saudi Arabia. Syria's initial involvement in Operation Desert Shield also rolled into the Allied Operation Desert Storm, as Syrian forces did participate in helping dislodge and drive Iraqi forces out of Kuwait City. Total losses sustained were two dead and one wounded. There were indications the Syrian government had been prepared to double its force to 40,000. Part of a Syrian SA-6 site built near the Beirut-Damascus highway and overlooking the Bekaa Valley, in early 1982 during the 1982 Lebanon War. In recent years Syria has relied on Russian arms purchases to obtain modern weapons. Purchases have included anti-tank and air defense systems. In early September 2008 the Syrian government ordered MiG-29SMT fighters, Pantsir S1E air-defence systems, Iskander tactical missile systems, Yak-130 aircraft, and two Amur-1650 submarines from Russia. Russia's Foreign Minister Sergei Lavrov asserted that the sale wouldn't upset the balance of power in the Middle East and were "in line with . . . international law." Russia aims to turn the Russian naval base in Tartus into a permanent base. Israel and the US oppose further arms sales to Syria due to fears that the weapons could fall under the control of Iran or Hezbollah fighters in Lebanon. A Syrian soldier manning a checkpoint near Damascus. Since the Syrian Civil War began, the Armed Forces have been sent to fight insurgents. As the uprising progressed into civil war, some Sunni soldiers began to defect from the Syrian Armed Forces and came together under the banner of the Free Syrian Army. In March 2012 the Syrian government issued new travel restrictions for military-aged males. Under the new restrictions, reported by local Syrian news outlets, all males between 18-42 were banned from traveling outside the country. In a late June 2012 interview given by the FSA's Asharq Al-Awsat he claimed Riad al-Asaad said that about 20–30 Syrian officers defected to Turkey each day. On 18 July 2012 Syrian Defense Minister Dawoud Rajha, former defense minister Hasan Turkmani and the president's brother-in-law Gen. Assef Shawkat were killed in a bomb attack in Damascus. Syrian intelligence chief Hisham Bekhityar and Head of the 4th Army Division Maher Al Assad--brother of President Assad--were also injured in the explosion. Since the start of the Syrian civil war, human rights groups say that the majority of abuses have been committed by the Syrian government's forces, and UN investigations have concluded that the government's abuses are the greatest in both gravity and scale. The branches of the Syrian Armed Forces that have committed war crimes include at least the Syrian Arab Army, Syrian Arab Air Force and the Syrian Military Intelligence. However the Syrian authorities deny these accusations  and claim that irregular armed groups with foreign support are behind the atrocities, including Al Qaeda linked Insurgents. The numbers in the Syrian armed forces have reduced considerably during the Civil War, although estimates vary. Russian sources give higher estimates. In 2011, 300,000 reserves were reported in addition to regular forces. In 2014, Gazeta.ru reported that the regular army had reduced from 325,000 to 150,000 due to "mortality, desertions and deviations", but that this was supplemented by 60,000 Republican Guards and 50,000 Kurdish militias. In 2015, LifeNews still reported the same figures. Despite shrinking by nearly half from the 2011 beginning of the civil war by 2014, the Armed Forces have become much more flexible and capable, especially in anti-guerilla warfare. Their modus operandi switched from traditional Soviet-modeled conventional military forces into a force of smaller groups fighting in close-quarters guerrilla combat with an increasing role for junior officers. In September 2018, Statista Charts estimated that the Syrian military had lost 111 warplanes since the beginning of the civil war, including reconnaissance and attack drones. The Syrians lost most of their warplanes during the first four years of the war, with losses significantly decreasing after the Russian intervention into the war. With its headquarters in Damascus, the Syrian military consists of air, ground and naval forces. Active personnel were estimated as 295,000 in 2011, with an additional 314,000 reserves. Paramilitary forces were estimated at 108,000 in 2011. In 2011, the majority of the Syrian military were Sunni, but most of the military leadership were Alawites. Alawites made up 12% of the pre-war Syrian population but 70% of the career soldiers in the Syrian Army. A similar imbalance is seen in the officer corps, where some 80% of the officers are Alawites. The military’s most elite divisions, the Republican Guard and the 4th Armored Division, which are commanded by Bashar al-Assad's brother Maher, are exclusively Alawite. Most of Syria’s 300,000 conscripts in 2011 were, however, Sunni. A Syrian soldier aims a Type 56 assault rifle from his position in a foxhole during a firepower demonstration, part of Operation Desert Shield. The soldier is wearing a Soviet-made Model ShMS nuclear-biological-chemical warfare mask. In 1987 Joshua Sinai of the Library of Congress wrote that the Syrian Arab Army (SAA) was the dominant military service, and as such controlled the senior-most posts in the armed forces and had the most manpower, approximately 80% of the combined services. In 1987 Sinai wrote that the major development in force organization was the establishment of an additional divisional framework based on the special forces and the organization of ground formations into two corps. In 2010 the International Institute for Strategic Studies estimated army regulars at 220,000, with an additional 280,000 reserves. That figure was unchanged in the 2011 edition of the Military Balance, but in the 2013 edition, in the midst of the war, the IISS estimated that army strength was 110,000. By the end of 2017, analysts estimated the SAA to have just 25,000 combat-ready troops. The army's active manpower served in three all-arms army corps, eight armored divisions (with one independent armored brigade), three mechanized divisions, one armored-special forces division and ten independent airborne-special forces brigades. The army had 11 divisional formations reported in 2011, with a fall in the number of armored divisions reported from the 2010 edition from eight to seven. The independent armored brigade had been replaced by an independent tank regiment. However, in addition to the 14th Special Forces Division, the 15th Special Forces Division has been identified by Human Rights Watch in 2011. The former Defense companies were merged into the Syrian Army as the 4th Armored Division and the Republican Guard. The 4th Armored Division became one of the Assad government's most trusted security forces. In 1950 the Syrian Navy was established following the procurement of a few naval craft from France. The initial personnel consisted of soldiers who had been sent to French academies of naval training. In 1985 the Navy consisted of approximately 4,000 regular and 2,500 reserve officers and men. The navy is under the army's Latakia regional command. The fleet was based in the ports of Latakia, Baniyas, Minat al Bayda and Tartus. Among the 41 vessel fleet were two frigates, 22 missile attack craft (including ten advanced Osa II missile boats), two submarine chasers, four mine warfare vessels, eight gunboats, six patrol craft, four missile corvettes (on order), three landing craft (on order), one torpedo recovery vessel and, as part of its coastal defense system, Sepal shore-based, anti-ship missiles with a range of 300 km. In 2011, the Navy was estimated have 5,000 personnel. 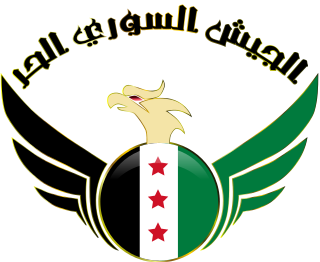 The Syrian Arab Air Force is the aviation branch of the Syrian Armed Forces. It was established in 1948 and saw combat in 1948, 1967, 1973 and in 1982 against Israel. It has seen combat against militant groups on Syrian soil from 2011-12, during the Syrian civil war. Presently there are at least 15 Syrian air force bases throughout the country. In 2011, Russian sources reported 40,000 personnel in the Air Force, while Reuters reported 100,000. In 1987, according to the Library of Congress Country Studies, the Air Defence Command, within the Army Command but also composed of Air Force personnel, numbered approximately 60,000. In 1987 units included 20 air defense brigades (with approximately 95 SAM batteries) and two air defense regiments. The Air Defence Command had command access to interceptor aircraft and radar facilities. Air defenses included SA-5 long-range SAM batteries around Damascus and Aleppo, with additional SA-6 and SA-8 mobile SAM units deployed along Syria's side of the Lebanese border and in eastern Lebanon. At some later point in time, the Air Defence Command was upgraded into a separate Syrian Air Defense Force. In 2011, Russian sources reported 60,000 personnel in Air Defense. See: List of armed groups in the Syrian Civil War#Syrian government and allies for more information on current paramilitaries due to the ongoing Syrian civil war. Defense Companies - since merged into the Syrian Arab Army as the 4th Armoured division and the Republican Guard as well as the 14th Airborne Division comprising five Special Forces regiments. Palestine Liberation Army - a Palestinian Auxiliary, ostensibly returned to Palestine Authority control. Republican Guard - since merged into the army. Struggle Companies - status unknown. National Defence Forces - a part-time volunteer reserve component of the military. As the Syrian Civil War progressed and casualties mounted, more and more positions were opened to women. The National Defense Force allows female volunteers into its ranks, mainly in securing checkpoints. The Republican Guard also formed a female section, an all-female tank battalion of 800 strong, nicknamed "Lionesses of Defense", fighting within the limits of Damascus. A Syrian military policeman during the Persian Gulf War. The breakup of the Soviet Union — long the principal source of training, material, and credit for the Syrian forces — may have slowed Syria's ability to acquire modern military equipment. It has an arsenal of surface-to-surface missiles. In the early 1990s, Scud-C missiles with a 500-kilometer range were procured from North Korea, and Scud-D, with a range of up to 700 kilometers, is allegedly being developed by Syria with the help of North Korea and Iran, according to Eyal Zisser. Syria received significant financial aid from Persian Gulf Arab states as a result of its participation in the Persian Gulf War, with a sizable portion of these funds earmarked for military spending. In 2005, Russia forgave Syria of three-fourths, or about $9.8 billion, of its $13.4 billion Soviet-era debt. Russia wrote off the debt in order to renew arms sales with Syria. As of 2011, arms contracts with Russia, Syria's main arms supplier, were worth at least $4 billion. Syria has conducted research and produced weapons of mass destruction. In 1987, according to a Library of Congress Country Study on Syria, service uniforms for Syrian military officers generally followed the British Army style, although army combat clothing followed the older British model. Each uniform had two coats: a long one for dress and a short jacket for informal wear. Army officer uniforms were khaki in summer, olive in winter. Certain Army and Air Defense personnel (i.e., commandos and paratroops) may have worn camouflage uniforms. Air force officers had two uniforms for each season: a khaki and a light gray for summer and a dark blue and a light gray in winter. Naval officers wore white in summer and navy blue in winter while lower ranks wear the traditional bell bottoms and white blouse. The uniform for naval chief petty officers was a buttoned jacket, similar to that worn by American chief petty officers. Officers had a variety of headgear, including a service cap, garrison cap, and beret (linen in summer and wool in winter). The color of the beret varied by season and according to the officer's unit. Syrian Commando and Paratroop uniforms consist of lizard or woodland-patterned camouflage fatigues along with combat boots, helmets and bulletproof vests. Headgear consisted of a red or orange beret. The Syrian military provides NBC uniforms to soldiers in order to remain effective in an environment effected by biological or chemical agents. This uniform consisted of a Russian-made Model ShMS-41 mask similar to those made in the Desert Storm conflict. Previous models of the ShMS used a hose, while the improved "ShmS-41" used a canister-style Respirator. In 1987, according to a Library of Congress Country Study on Syria, the rank insignia of Syrian commissioned officers were identical for both the army and air force. These were gold on a bright green shoulder board for the army and gold on a bright blue board for the air force. Officer ranks were standard, although the highest is the equivalent of lieutenant general, a rank held in 1986 only by the commander in chief and the minister of defence. Navy officer rank insignia were gold stripes worn on the lower sleeve. The highest-ranking officer in Syria's navy is the equivalent of lieutenant general. Army and air force rank for warrant officers were indicated by gold stars on an olive green shield worn on the upper left arm. Lower noncommissioned ranks were indicated by upright and inverted chevrons worn on the upper left arm. Although some twenty-five orders and medals were authorized, generally only senior officers and warrant officers wear medal ribbons. The following were some important Syrian awards: Order of Umayyads, Medal of Military Honor, the War Medal, Medal for Courage, Yarmuk Medal, Wounded in Action Medal, and Medal of 8 March 1963. ^ "Bashal al-Assad in uniform with rank of Marshal". thewhatandthewhy.com. Archived from the original on 9 October 2017. Retrieved 24 March 2018. ^ a b c "Syria increasing efforts to build up military after substantial losses". South China Morning Post. 29 December 2014. Archived from the original on 30 December 2014. Retrieved 29 December 2014. ^ "Assad's army stretched but still seen strong". The Daily Star Newspaper - Lebanon. Archived from the original on 8 July 2015. Retrieved 29 June 2015. ^ Military Expenditure of Syria Archived 27 March 2018 at the Wayback Machine. ^ "Syria reduces compulsory military service by three months". China Daily. Xinhua News Agency. 20 March 2011. Archived from the original on 3 May 2011. Retrieved 6 October 2012. ^ Joshua Sinai (1987). A Country Study, Syria (PDF). Library of Congress. p. 190. Archived from the original (PDF) on 6 April 2012. Retrieved 21 July 2011. ^ "Full text of "Syria : a country study"". archive.org. Archived from the original on 25 July 2017. Retrieved 5 June 2016. ^ Joshua Sina (1987). Development of the Syrian Military. Library of Congress. Archived from the original on 10 January 2009. Retrieved 21 July 2011. ^ Pollack 2002, p. 457–458. ^ Seale 1990, p. 72. ^ a b c d Bhalla, Reva (5 May 2011). "Making Sense of the Syrian Crisis". Stratfor. Archived from the original on 9 October 2017. Retrieved 9 May 2011. ^ Schwarzkopf 1993, p. 467–469. ^ Katz, Yaakov (3 September 2009). "'Russia confirms MiG jet sale to Syria'". The Jerusalem Post. ^ "Russia defends arms sales to Syria". United Press International. 29 September 2008. Archived from the original on 12 April 2011. Retrieved 30 September 2008. ^ "40 Syrian military officers defect with weapons". Al-Ahram. 24 June 2012. Archived from the original on 5 July 2012. Retrieved 24 June 2012. ^ David Enders (27 March 2012). "As Syria's war rages, Assad bans military-age men from leaving". The Christian Science Monitor. Archived from the original on 22 June 2012. Retrieved 24 June 2012. ^ Damien McElroy (18 July 2012). "Assad's brother-in-law and top Syrian officials killed in Damascus suicide bomb". Daily Telegraph. London. Archived from the original on 19 July 2012. Retrieved 18 July 2012. ^ Gianluca Mezzofiore (18 July 2012). "Syria Civil War: Assad Brother-in-Law Assef Shawkat Killed in Damascus Suicide Bombing". International Business Times. Archived from the original on 20 July 2012. Retrieved 18 July 2012. ^ "Two Syrian rebel groups claim Damascus attack". Reuters. 18 July 2012. Archived from the original on 19 July 2012. Retrieved 18 July 2012. ^ "UPDATE 4-Syrian govt forces, rebels committing war crimes -U.N." Reuters. Archived from the original on 20 October 2012. Retrieved 17 December 2012. ^ "Friends of Syria must use their influence to stop cycle of repression and violence". Amnesty International. 5 July 2012. Archived from the original on 6 December 2012. Retrieved 19 January 2013. ^ "Why the Syrian regime is killing babies". CNN.com. Archived from the original on 22 August 2013. Retrieved 3 September 2013. ^ "Syrian siege of Homs is genocidal, say trapped residents". The Guardian. 7 February 2012. Archived from the original on 25 February 2017. Retrieved 16 December 2016. ^ "Syria: Despite Denials, More Cluster Bomb Attacks" Archived 18 December 2016 at the Wayback Machine. HRW.org. 23 October 2012. ^ "Torture Archipelago: Arbitrary Arrests, Torture and Enforced Disappearances in Syria's Underground Prisons since March 2011" (PDF). Human Rights Watch. July 2012. Archived (PDF) from the original on 25 July 2012. Retrieved 3 July 2012. ^ "Al-Assad denies responsibility for Syria crackdown". CNN. 7 December 2011. Archived from the original on 24 December 2013. Retrieved 23 December 2013. ^ "Syrian government denies involvement in Houla massacre". RT. 28 May 2012. Archived from the original on 24 December 2013. Retrieved 23 December 2013. ^ "Exclusive: Obama authorizes secret U.S. support for Syrian rebels". Reuters. 1 August 2012. Archived from the original on 2 August 2012. Retrieved 2 July 2017. ^ "Saudi Arabia plans to fund Syria rebel army". The Guardian. 22 June 2012. Archived from the original on 18 December 2016. Retrieved 16 December 2016. ^ "UN chief says Al Qaeda behind Syria bombings". RT. 19 December 2013. Archived from the original on 24 December 2013. Retrieved 23 December 2013. ^ "Al-Qaida-linked group accused of torture in areas of Syria it controls". The Guardian. 18 May 2012. Archived from the original on 22 July 2016. Retrieved 16 December 2016. ^ Sylvia, Westall. "Assad's army stretched but still seen strong". The Daily Star. Archived from the original on 22 September 2014. Retrieved 23 September 2014. ^ a b c "Вооруженные силы Сирии". Archived from the original on 7 April 2016. Retrieved 20 May 2016. ^ "Сколько людей и оружия по обе линии сирийского противостояния". Газета.Ru. Archived from the original on 31 July 2016. Retrieved 20 May 2016. ^ "LifeNews изучил состояние сирийской армии на момент введения ВКС РФ". Life.ru. 1 October 2015. Archived from the original on 27 January 2016. Retrieved 20 May 2016. ^ a b "Syria army adapts to guerrilla war". The Daily Star. 22 October 2014. Archived from the original on 22 October 2014. Retrieved 22 October 2014. ^ "Infographic: Aircraft Lost During The Syrian Civil War". Statista Infographics. 18 September 2018. Archived from the original on 5 November 2018. Retrieved 27 January 2019. ^ a b c IISS 2011, p. 330. ^ a b c d e "Syria's military: what does Assad have?". Reuters. 6 April 2011. Archived from the original on 1 May 2011. Retrieved 5 May 2011. ^ "Background Note: Syria". US State Department. Archived from the original on 17 October 2012. Retrieved 14 September 2011. ^ a b Sinai, Joshua (April 1987). Collelo, Thomas (ed.). A Country Study: Syria. Federal Research Division, Library of Congress. Archived from the original on 2 February 2017. Retrieved 12 April 2019. ^ Waters, Gregory (21 April 2018). "The Growing Role of Reconciled Rebels in Syria". International Review. Retrieved 30 October 2018. ^ IISS 2010, p. 272–273. ^ "By All Means Necessary!". Human Rights Watch. 16 December 2011. p. 12. Archived from the original on 22 October 2014. Retrieved 4 December 2016. ^ "Syrian Arab Navy". Global Security. Archived from the original on 6 October 2008. Retrieved 2 October 2008. ^ Al-Tamimi, Aymenn Jawad. "The Local Defence Forces: Regime Auxiliary Forces in Aleppo". aymennjawad.org. Archived from the original on 26 March 2018. Retrieved 24 March 2018. ^ Al-Tamimi, Aymenn Jawad. "Administrative Decisions on Local Defence Forces Personnel: Translation & Analysis". aymennjawad.org. Archived from the original on 28 February 2018. Retrieved 24 March 2018. ^ "Battalion of Syrian women commandos in clashes with rebels in Damascus - Daily Mail Online". Mail Online. Archived from the original on 14 June 2015. Retrieved 29 June 2015. ^ Weitz, Richard (2010). Global security watch--Russia: A reference handbook. Santa Barbara, Calif.: Praeger Security International. p. 30. ISBN 978-0-313-35434-2. Archived from the original on 29 July 2016. Retrieved 12 October 2015. ^ "SIPRI Arms Transfers Database". Stockholm International Peace Research Institute. Archived from the original on 28 July 2011. Retrieved 8 September 2011. ^ Amos, Howard (26 August 2011). "News Analysis: Russia Damages Image in Arab Spring". The Moscow Times. Archived from the original on 22 December 2011. Retrieved 8 September 2011. ^ "Russian defence industry and arms trade: facts and figures" (PDF). Centre for Analysis of Strategies and Technologies. pp 15. Archived (PDF) from the original on 20 November 2011. Retrieved 8 September 2011. ^ Meyer, Henry (7 September 2011). "Assad Ouster Bid May Unleash 'Chaos in Mideast,' Russia Says". Bloomberg. Archived from the original on 27 April 2012. Retrieved 8 September 2011. ^ "Syria not next on list, says Britain". Sydney Morning Herald. 14 April 2003. Archived from the original on 18 April 2014. Retrieved 4 December 2012. ^ a b c Joshua Sina (1987). Uniforms and Rank Insignia. Library of Congress. Archived from the original on 2 February 2017. Retrieved 21 July 2011. ^ Gordon Rottman (27 May 1993). Armies of the Gulf War. Osprey Publishing. p. 58. ISBN 978-1-85532-277-6. Archived from the original on 22 April 2014. Retrieved 20 March 2013.
International Institute for Strategic Studies (2011). The Military Balance 2011. Routledge. ISBN 978-1-85743-606-8.
International Institute for Strategic Studies (2010). The Military Balance 2010. Routledge. ISBN 978-1-85743-557-3. Pollack, Kenneth (2002). Arabs at War: Military Effectiveness, 1948–1991. University of Nebraska Press. ISBN 978-0-8032-3733-9. Seale, Patrick (1990). Asad of Syria: The Struggle for the Middle East. University of California Press. ISBN 978-0-520-06976-3. Armed Forces in the Middle East: Politics and Strategy edited by Barry Rubin and Thomas A. Kearney. London and Portland, OR: Frank Cass, 2002. BESA studies in international security, ISSN 1368-9541. ISBN 0714652555; ISBN 0714682454. Syria chapter by Eyal Zisser. Bashar Hafez al-Assad is a Syrian politician who has been the President of Syria since 17 July 2000. He is also commander-in-chief of the Syrian Armed Forces and Regional Secretary of the Arab Socialist Ba'ath Party's branch in Syria. He is a son of Hafez al-Assad, who was President of Syria from 1971 to 2000. The Syrian Air Force, officially the Syrian Arab Air Force, is the air force branch of the Syrian Armed Forces. It is variously abbreviated in English to SAF, SAAF, or SyAAF. It was established in 1948. Land-based air defense systems are grouped under the Syrian Air Defense Force, which split from both the Air Force and the Army. Rifaat Ali al-Assad is the younger brother of the former President of Syria, Hafez Assad and Jamil Assad, and the uncle of the incumbent President Bashar al-Assad. He is alleged by some sources to be the commanding officer responsible for the Hama massacre of 1982. Recently declassified material back his claims that his brother Hafez al-Assad was responsible, as do a number of commentators. Despite accusations, Rifaat has always denied culpability. He currently lives in France. The Syrian Army, officially the Syrian Arab Army (SAA), is the land force branch of the Syrian Armed Forces. It is the dominant military service of the four uniformed services, controlling the most senior posts in the armed forces, and has the greatest manpower, approximately 80 percent of the combined services. The Syrian Army originated in local military forces formed by the French after World War I, after France obtained a mandate over the region. It officially came into being in 1945, before Syria obtained full independence the following year. The Syrian occupation of Lebanon began in 1976, during the Lebanese Civil War, and ended in 2005 following the assassination of former Lebanese Prime Minister Rafic Hariri. The Syrian Republican Guard, also known as the Presidential Guard, is an elite 25,000 man mechanized division. Its main purpose is to protect the capital, Damascus, from any foreign or domestic threats. The Guard was the only Syrian military unit allowed within the capital city before the war. Umayyad Square is a large and important square in Damascus, Syria. It connects the city center with several important highways and areas and contains various important buildings including but not limited to the Ministry of Defense, Syria's national Opera house and the headquarters of the Syrian Armed Forces. Dawoud Abdallah Rajiha, forename sometimes transliterated Dawood or Daoud, surname sometimes transliterated Rajha, was the Syrian minister of defense from 2011 to July 2012 when he was assassinated along with other senior military officers by armed opposition forces during the country's Civil War. From 2009 to 2011, Rajiha served as chief of staff of the Syrian Army. Fahd Jassem al-Freij is the former Minister of Defense of Syria, taking office on 18 July 2012. The Islamic Republic of Iran and the Syrian Arab Republic are close strategic allies, and Iran has provided significant support for the Syrian Government in the Syrian Civil War, including logistical, technical and financial support, as well as training and some combat troops. Iran sees the survival of the Syrian government as being crucial to its regional interests. Iran's supreme leader, Ali Khamenei, was reported in September 2011 to be vocally in favor of the Syrian government. When the uprising developed into the Syrian civil war, there were increasing reports of Iranian military support, and of Iranian training of NDF both in Syria and Iran. The early insurgency phase of the Syrian Civil War lasted from late July 2011 to April 2012, and was associated with the rise of armed oppositional militias across Syria and the beginning of armed rebellion against the authorities of the Syrian Arab Republic. Though armed insurrection incidents began as early as June 2011 when rebels killed 120–140 Syrian security personnel, the beginning of organized insurgency is typically marked by the formation of the Free Syrian Army (FSA) on 29 July 2011, when a group of defected officers declared the establishment of the first organized oppositional military force. Composed of defected Syrian Armed Forces personnel, the rebel army aimed to remove Bashar al-Assad and his government from power.